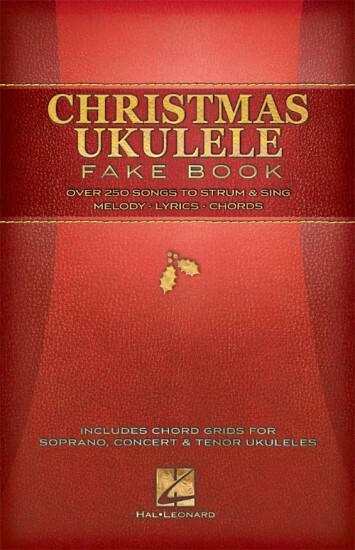 Over 250 Great Songs packed into one handy, portable book! Includes melody/lyrics/chords for: All I Want for Christmas Is You • All I Want for Christmas Is My Two Front Teeth • Baby, It's Cold Outside • Do You Hear What I Hear • Blue Christmas • Feliz Navidad • Brazilian Sleigh Bells • Frosty the Snow Man • Caroling, Caroling • Goin' on a Sleighride • The Chipmunk Song • Grown-Up Christmas List • Christmas (Baby Please Come Home) • Happy Xmas (War Is Over) • Hard Candy Christmas • Christmas Is • Have Yourself a Merry Little Christmas • The Christmas Shoes • Here Comes Santa Claus (Right down Santa Claus Lane) • The Christmas Song (Chestnuts Roasting on an Open Fire) • (There's No Place Like) Home for the Holidays • Christmas Time Is Here • I'll Be Home for Christmas • Christmas Wrapping • I've Got My Love to Keep Me Warm • It's Beginning to Look like Christmas • It's Christmas in New York • Jingle Bell Rock • Let It Snow! Let It Snow! Let It Snow! • Little Saint Nick • A Marshmallow World • Mele Kalikimaka • Merry Christmas, Darling • The Most Wonderful Time of the Year • My Favorite Things • Nuttin' for Christmas • Rockin' Around the Christmas Tree • Rudolph the Red-Nosed Reindeer • Santa, Bring My Baby Back (To Me) • Santa Claus Is Comin' to Town • Silver and Gold • Silver Bells • Sleigh Ride • Snowfall • This Christmas • What Are You Doing New Year's Eve? • White Christmas • Wonderful Christmastime • You're a Mean One, Mr. Grinch • You're All I Want for Christmas • and more.